The leading cause of drug overdoses in America is no longer cocaine, meth, or even heroin or common opioid painkillers like Percocet and OxyContin. It’s synthetic opioids like fentanyl and its analogs. Fentanyl has made America’s opioid epidemic, already the deadliest drug overdose crisis in US history, even deadlier. In 2015, more than 52,000 people died of drug overdoses. In 2016, the total rose to more than 64,000. 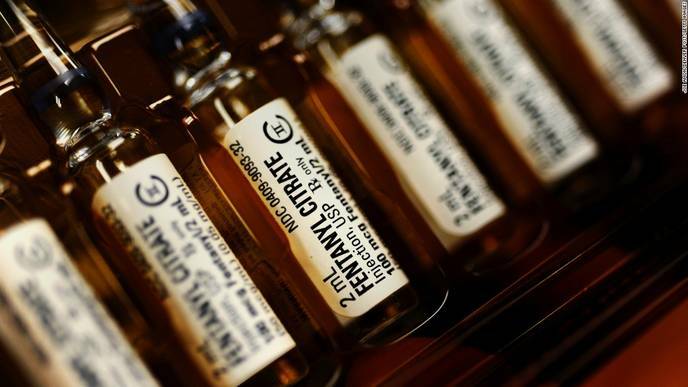 A spike in fentanyl overdose deaths was perhaps the key contributor: Overdose deaths linked to synthetic opioids like fentanyl jumped from nearly 10,000 in 2015 to nearly 20,000 in 2016 — surpassing common opioid painkillers and heroin for the first time. So what exactly is fentanyl? And why is this drug, which has been around as medicine for decades, popping up as a big cause of death now? The short answer is that as people who use drugs have moved from opioid painkillers to seek out more potent, cheaper drugs, there has been a destructive race to find the most affordable high. Fentanyl, as a drug that’s relatively easy to produce for a better, cheaper high per dose than heroin, has become the natural destination for traffickers and users who want the strongest products. This also offers a stark warning about the opioid epidemic: When it comes to cracking down on opioids, just going after the drug’s supply isn’t enough. If you go after opioid painkillers, people will eventually go to heroin. If you go after heroin, they’ll eventually go to fentanyl. And if you go after fentanyl, they might resort to some of its analogs, like carfentanil. This drug crisis, then, likely requires a response that also tackles the core demand for these drugs, particularly through new forms of drug prevention and treatment that can get people off these dangerous substances altogether. To understand that, let’s first pull back to what fentanyl and its analogs are, where they came from, and what they can teach us about the opioid epidemic’s trajectory. Fentanyl is, traditionally, a synthetic opioid used medically to relieve pain. It was first made in the 1960s, and since then it’s been adopted as a spray, patch, lollipop, and other mediums for pain relief. As it appears in the illicit market, though, fentanyl is really a category for several synthetic opioids that function similarly. “We talk about fentanyl … but there are literally dozens of compounds out there that really belong in a class called fentanyls — fentanyl plural,” David Juurlink, a doctor who studies the opioid epidemic at the University of Toronto, told me. So it’s not just fentanyl that’s causing a spike in overdose deaths. It’s also analogs like carfentanil, which has also drawn media attention as it’s appeared in the illicit drug market. Carfentanil is typically used as a sedative for large animals like elephants. Its use is widely considered too dangerous for humans; the Associated Press even described it as a “chemical weapon” because several countries, including the US, have actually prepared for its potential use in war. Unlike heroin, fentanyl and its analogs can be made fairly easily in a lab. That makes fentanyl far cheaper to produce, without the hassle of growing opium poppy and then converting the poppy into morphine and then into heroin. Over the past few years, fentanyl and its analogs have appeared in the streets, often laced into the illicit heroin supply. Law enforcement officials believe that most of this fentanyl comes from labs in China, where it’s produced without the supervision of US drug regulators and law enforcement officials who would very much like the drug to stop going to illegal recreational uses. The drug is then shipped from China to the US, typically through Latin America. Along the way, it’s cut into heroin by drug traffickers and dealers, who can then make more money out of their newly cut heroin since it will have more kick for a lower dose. Generally, fentanyl is described as anywhere from 40 to 100 times more potent than morphine and several times more potent than heroin. While it’s hard to get any good numbers for potency, Juurlink believes these descriptions are broadly accurate for fentanyl. One way to understand just how potent fentanyl can be: It often negates naloxone, an antidote used to reverse opioid overdoses. While first responders can typically use one dose of naloxone to save someone’s life if she’s overdosing on common painkillers or heroin, they’ve found that multiple doses of naloxone can be needed to fight back a fentanyl overdose. Now, none of this is to say that fentanyl is the only threat in the illicit opioid market. Heroin, by itself, is also pretty dangerous. Just look at the tens of thousands of deaths linked to it before fentanyl made a big entrance to the drug market in the past few years. But fentanyl is more potent, and that makes it more likely to cause an overdose. One of the things that makes these drugs so deadly is very often drug users don’t seek them out, instead buying heroin that turns out to be laced with potent fentanyl or one of its analogs. So a heroin user will try the same dose he’s always tried, only to end up overdosing because of the unexpected fentanyl adding far more than he can handle. But sometimes drug users deliberately take these drugs. Prince, for one, overdosed on fentanyl he was reportedly taking for medical purposes, although he was struggling with drug addiction at the time of his death. And there have been a few reports of drug users seeking out these drugs, sometimes because they find out that the drugs are leading to more overdoses and figure that, therefore, they must be really potent. Beyond causing a spike in overdose deaths, fentanyl and its analogs also help show the problems with typical anti-drug strategies. The traditional “war on drugs” approach is to go after the supply of these substances. The thinking is that if you can eliminate or at least hinder the supply of drugs, they will become unavailable — or at least much more expensive due to the laws of supply and demand — and people will, over time, stop using them. The opioid epidemic has exposed why this isn’t a good enough strategy to deal with a drug crisis. As drug users saw their painkiller sources cut off, they began to move on to other kinds of opioids. So as opioid painkiller deaths began to level off, heroin deaths began to increase. The data bears this out: A 2014 study in JAMA Psychiatry found 75 percent of heroin users in treatment started with painkillers, and a 2015 analysis by the CDC found people who are addicted to painkillers are 40 times more likely to be addicted to heroin. Now, it’s also likely that many opioid users may have moved on to heroin anyway. One of the common characteristics of drug addiction, after all, is people will seek out better and stronger highs over time. So the progression from painkillers to heroin was perhaps inevitable for many drug users. And as the opioid epidemic continues, there’s evidence that more and more people are now starting their opioid use on heroin instead of painkillers. Still, the government crackdown likely pushed some people from painkillers to heroin. A similar story seems to be going on with fentanyl now. Some drug users, seeking out a stronger kick, are looking for something even stronger than heroin. Drug traffickers, expecting that their customers want something stronger, have started lacing fentanyl into heroin to sell a product that’s simultaneously more potent and cheaper per dose — although, as we’ve seen, sometimes drug users aren’t ready for this extra-potent product, so they overdose. This is an example of what drug policy experts call the “balloon effect”: When a drug’s supply is limited, users and traffickers don’t give up; they instead find other ways to get their high. It’s like pushing down on a half-inflated balloon: The air doesn’t vanish, but instead, moves to another part of the balloon. The balloon effect has been observed not just with the crackdown on opioids, but with anti-drug efforts in Latin American countries. After the governments there cracked down on the illicit drug trade in the 1990s and 2000s, it simply shifted to other parts of Central and South America — which is one reason we now hear a lot more about Mexico in the drug trade than Colombia and the Caribbean. This effect is one of the primary reasons the war on drugs has failed to significantly curtail drug trafficking. The balloon effect helps explain the rise of fentanyl, as crackdowns shifted people from painkillers to heroin and now fentanyl. And it’s why continuing to crack down on painkillers and heroin without reducing demand from drug users for these substances is ineffective and even risky. The balloon effect doesn’t necessarily mean that the crackdown on opioid painkillers was a mistake. It appeared to slow the rising number of painkiller deaths, and it may have prevented doctors from prescribing the drugs — or letting them proliferate — to new generations of people who’d develop drug use disorders. So the crackdown did lead to more heroin and fentanyl deaths, but it will hopefully prevent future populations of drug users, who could have suffered even more overdose deaths. Still, the fundamental solution needs to be reducing the demand for opioids — so that people don’t seek out dangerous drugs like heroin or fentanyl in the first place. To put it simply: While a crackdown on supply might stop future generations of drug users, it doesn’t do much for the current generation of drug users who are addicted and want these drugs. That’s where treatment can come in to help people quit their addictions. There has been some movement in that direction, such as when Congress in 2016 approved$1 billion over two years for drug addiction treatment. But drug policy experts widely agree that much more money will need to be put toward addiction treatment. After all, a 2016 report from the US surgeon general found that only 10 percent of people with a drug use disorder get specialty treatment — in large part because there is a huge shortage of accessible and affordable options. Some experts estimate it will take tens of billions dollars a year to remedy this gap. Beyond raw funding for treatment, some drug policy experts would also like to see a change in how treatment is done. For some people, lifelong drug use is likely a reality. The best treatments for opioid addiction — meaning medication-assisted treatment, which pairs therapy with medicine like buprenorphine and methadone — only work for about 60 percent of users. That’s a lot of patients who can’t be reached by the gold standard of care and will continue to use (and die) as a result. So some experts have pushed for actually supplying pure heroin in supervised injection facilities. The thinking is simple: At the very least, drug users will know these drugs are not laced with fentanyl or its analogs. If they do overdose, staff will be standing by to apply naloxone or oxygen to prevent death. And while users are at these facilities, they can be linked to treatment to, perhaps, slowly get off the heroin. This isn’t just the stuff of wonks’ imaginations. It’s now done in multiple countries, from Canada to Switzerland. And here’s the important thing: It really works. Researchers credit the European prescription heroin programs with better health outcomes, reductions in drug-related crimes, and improvements in social functioning, such as stabilized housing and employment. Canadian studies also deemed prescription heroin effective for treating heavy heroin users. A review of the research — which included randomized controlled trials from Switzerland, the Netherlands, Spain, Germany, Canada, and the UK — reached similar conclusions, noting sharp drops in street heroin use among people in the treatment. Now, this treatment is likely only going to be needed for a small fraction of opioid users. When I visited the prescription heroin clinic in Vancouver, Canada, staff there estimated that about 10 to 15 percent of people addicted to opioids will need the treatment they provide. But the expanding opioid epidemic shows why it might be necessary. Going after the supply of opioids has led to the supply getting more dangerous, emphasizing the need for more action on the demand side. Medication-assisted treatment is great, but it and other more conventional forms of treatment don’t work for everyone. So as addiction treatment scales up, it might be a good idea to take some newer harm reduction steps that also try to mitigate the dangers of the illicit opioid supply. Heroin-assisted treatment also shows the need to be creative with the current drug crisis. It’s definitely not an idea that US policymakers or the public will be accustomed to. But it works for some patients.